Memento Mori (2018) by Euripides and Peter Thomas. 9 1/2 by 3 5/8 by 1 inch. 26 pages (13 leaves). The text combines Latin phrases exploring a theme first found in Euripides's tragedy Alcestis, "No one can say for certain they will still be living tomorrow." 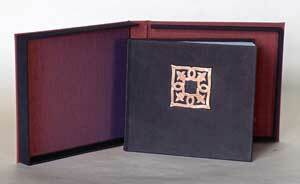 Full bound in black Moroccan leather with Peter's woodcut on a panel on the front cover. 20 copies (16 available for sale). Sold out. 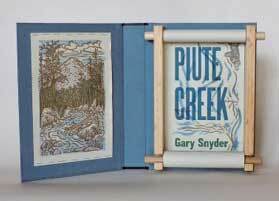 Piute Creek (2017) by Gary Snyder. A scrolling book. 11 by 9 by 1 3/4 inches. 30 copies. $950. Only Love: Haiku by Albion (2016) by Albion Smith. (Two books in a clamshell box.) A collaborative project with a master jeweler, type designer and poet. One book contains fourteen of Smith's haiku poems, printed letterpress using Smith's hand-cut letters; the other is a digitally produced book that chronicles the making of the poetry book. 7 5/8 by 8 ½ by 1 3/8 inches. 30 copies. $550. Rock After Rock: Backpacking the Sierra High Route (2016) by Donna Thomas. Historic quotes about finding a route along the crest of the Sierra Nevada, plus contemporary narratives written by Donna's hiking companions while following Steve Roper's guide to the High Route. 25 digitally printed watercolor paintings, calligraphic text and hand drawn maps letterpress printed with colorful split fountian on handmade paper. 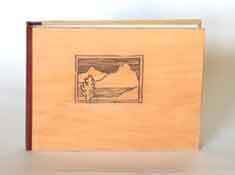 Quarter bound with wooden boards and a leather spine, hand-carved mountain scene on front cover, held in "backpack" slipcase. 7 7/8 by 10 1/2 inches. 32 pages. 20 copies. $975. The Tuckenhay Mill: People and Paper (2016) Peter Thomas. 4-6 items in clamshell box. 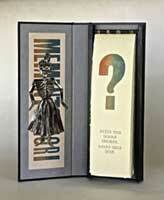 All copies have: Introductory pamphlet, letterpress printed, 1. They Made the Paper in Tuckenhay Mill - interviews with retired hand papermakers, a 100-page digitally printed book with the text of the interviews. 2. Flash drive with audio files, transcriptions and videos from original interviews. 3. Vintage handmade paper samples and printed ephemera from Tuckenhay Mill. (1- 21 have pamphlet titled Handmade Paper in Tuckenhay Devon. 1-15 copies have pamphlet titled Three Hundred Years of Paper Making). 13 by 9 7/8 by 2 3/8 inches. 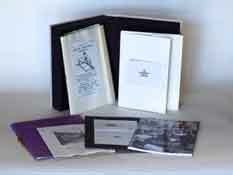 Copy 1-10 have all 22 samples and both additional booklets. $sold. Copy 11-15 have 21 samples and both additional booklets. $sold. Copy 16 has 21 samples and one additional booklet. $sold. Copy 17-20 have 18 samples and one additional booklet. $1150. Copy 21-28 have 18 samples. $970. Copy 29-30 have 17 samples. $970. 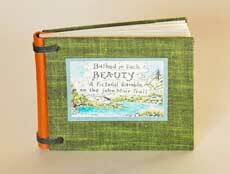 Bathed in Such Beauty: A Pictorial Ramble on the John Muir Trail (2016) John Muir. Donna's calligraphy and original watercoler illustrations have been digitally printed on Peter's handmade paper. The paintings made in 2012 by Donna while hiking the John Muir Trial. The binding has a leather spine with cloth-covered boards and an inset title label. 3 ¼ by 4 by ½ inches. 14 illustrations. 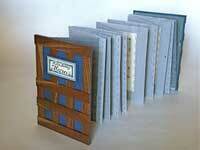 24 panel accordion book. 200 copies. $125.00. Sometimes I Pretend (2014) by Naomi Shihab Nye. 4 1/4 by 10 3/8 by 4 1/4 inches. One scrolling page. 35 copies. $695. The Renaissance Pleasure Faire Broadsides (2014) Texts by various authors. 17 1/2 by 12 1/2 inches. 12 folder pages. 25 copies. $875. The Alder (2012) William Everson. Wandering (2011) T. S. Eliott. 7 by 5 inches. The text is an excerpt from the poem "Four Quartets". 2 lino cuts, printed letterpress in many colors. 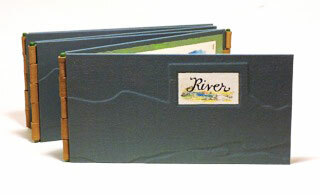 A flap book binding structure. 14 copies. $195. Click here for more images and information. The Pencil (2010) Peter Thomas. 8 ½ by 5 ½ inches . This book tells a brief history of the pencil, and has a display of vintage advertising pencils in a pencil cedar wood holder. Text hand written and colored with pencil. Tri-fold binding, with oasis goat leather spines and paper printed with multiple-layered multi-colored wood type. 12 pages. 30 copies. Sold out. Click here for more images and information. The History of Papermaking in the Philippines. (2005) Written by Peter Thomas. Illustrated by Donna Thomas. 10 3/4 by 13 5/8 inches. 50 pages. Five special copies accompanied by a suite of prints from the book. 75 copies. $950. Papermaking in the Philippines: Overseas File 664 from the Archivo General de Indias, Sevilla, Spain. (2005) Edited by Peter Thomas. 8 1/8 by 7 1/8 inches, 36 pages. This is the full translation of the text referred to in Appendix One to our History of Papermaking in the Philippines. $75. Meditations at the Edge: Paper and Spirit (1996). Dorothy Field's observations of how paper has been used in the Orient to connect the physical and the spiritual worlds. Four illustrations by the author. Letterpress printed in Centaur on Peter and Dorothy's handmade papers. 42 pages. 11 1/4 by 4 1/2 inches. 14 special copies have pages mounted on wooden dowels housed in a wooden pagoda. 12 1/2 by 16 inches. 1-14 sold, 14-100 $350. Sold out. The Tarantella Rose (1995). Previously unpublished poems by William Everson. 7 linocut illustrations by Donna. Letterpress printed with Weiss type on Peter's handmade paper. modified limp vellum binding using Peter's handmade paper. 7 special copies have hand colored and quarter bound, red moroccan and origami folded handmade paper.10 5/8 by 7 5/8 inches. 38 pages. Copies 1-75, $495. one copy left. Bikupan / The story of a trip to visit a hand paper mill in Sweden, with a bit of history added in for good measure (1992). Peter Thomas. 10 1/2 by 7 1/2 inches. 36 pages. 119 copies. $395. Papermaking in Seventeenth Century England (1990). Peter Thomas. The diary entries written by John Evelyn and Celia Fiennes, recording their visits of paper mills during the late 1600's, are preceded by short biographies and accompanied by commentary on the author's observations. 6 3/4 by 5 inches. 42 pages. 200 copies. $395. A Tale of Life (1984). Peter Thomas. A story about the cycle of life, with a full page linocut by Donna. 15 by 10 1/4 inches. 8 pages. 75 copies. $200. The Fire of the Dragon Yudur (1981). Peter Papermaker/Peter Thomas. 8 1/4 by 5 3/8 inches. 12 pages. 75 copies $295. The text is a fairy tale written by Peter, illustrated by Donna, hand set then printed on Peter's handmade paper, and hand bound by Donna. To Err is Human (2014) Latin aphorism. 5 ¾ by 6 5/8 by 1 1/4. 5 copies. $sold. Not Paper. (2010) Peter Thomas. 8 3/4 by 5 inches. This book is About the paper-like materials that are not paper. Letterpress printed with wood type, Centaur and Neuland, 8 samples tipped in. Full bound in antique oasis goat leather. Clamshell box. 20 accordion pages. 48 copies, $645. Sold out. Click here for more images and information. 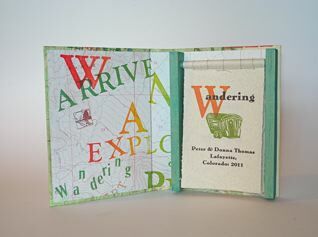 The Wandering Book Artists' Collaborative Broadsides (2011) Peter and Donna Thomas. 13 ¼ by 11 inches. Twelve broadsides created during our "Wandering Book Artist" trip around the country, plus a booklet describing each printing experience. Translucent folder in clamshell box. 14 pages. 50 copies. $875. Click here for more images and information. Sold out.